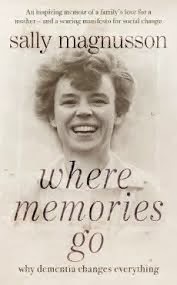 Sally Magnusson the daughter of former Mastermind quizmaster, Magnus, has written a very perceptive and moving memoir of her mother Mamie, and her slow descent into dementia. Entitled, Where memories go, Sally recalls the subtle indications at first, and one particular incident when she noticed her mothers ‘mislaid curiosity’. Mamie had been a lively and engaging woman, eclectic and diffuse in her interests, and always an encourager of Sally and her various projects. So when Sally excitedly told her mum about some detail of family research that she had successfully completed, she was surprised by Mamie’s slight indifference, and a simple, ‘Oh’, rather than, ‘Oh really, tell me more”, which would have been a more typical response. It was her mislaid curiosity that alerted Sally to a significant change in her mum. It proved to be one many observations that lead eventually to a diagnosis of dementia. One of the joys of being a family doctor is the endless variety of problems one encounters on any given day. The need to understand people and their multitude differing ways of facing illness or their various forms of relationship difficulty, or the constant drain of caring for an increasingly dependant loved one, or a mix of symptoms that just does not comply with a textbook description. GPs need to be constantly curious. I guess that's another way of saying that we need to be life-long learners. Now towards the end of my career I am glad to still be trying learn. Human beings are so complex and do not yield up their secrets easily. Even the most apparently straightforward consultation may have the potential for raising questions of will I get better? How can I cope? What about my work, my family, my lifestyle, my looks etc? One of the best pieces of advice a good friend gave me when I got married was, to keep a sense of humour. Perhaps one of the best adages for a long career in general practice is to never mislay your curiosity.